Tetralogy of Fallot | Adventures of a Funky Heart! There was once a heart surgeon who was the acknowledged expert in Pediatric Heart Surgery. Dr. Helen Taussig once approached him asking for advice about re-routing some blood vessels to relieve a Congenital Malformation of the Heart known as Tetralogy of Fallot (ToF). This surgeon was not Dr. Alfred Blalock. As I mentioned yesterday, everyone is born with two heart defects: The foramen ovale and the ductus arteriosus, which is a direct connection between the Pulmonary Artery and the Aortic Arch. It allows blood coming from the Right Ventricle to bypass the lungs, and it closes shortly after birth. If it fails to close it is refered to as a “patent ductus arteriosus” (PDA), and can lead to Congestive Heart Failure. Robert Gross was born in 1905 and by 1938 was the Chief Resident at Children’s Hospital in Boston. Children’s Hospital had been experimenting with closing PDAs in animals and was having success, and Gross was eager to try the repair in a human. Being a good Resident, he asked his boss, highly respected Surgeon-in-Chief Dr. William E. Ladd. Ladd said no – we do not touch the heart. Not long after that, Dr. Ladd went on vacation. Dr. Gross went to his substitute, Dr. Thomas Lanman, and again asked permission. Lanman gave him the OK, and on August 26, 1938, Dr. Gross closed the PDA of a little girl named Lorraine Sweeney. Everything went perfectly. Dr. Ladd came back from vacation, learned what had happened, and fired Dr. Gross. Gross wasn’t out of work for long – the higher-ups at Boston Children’s thought the surgery was a great thing, and sent Dr. Ladd to rehire Dr. Gross! Rather than holding a grudge against Gross, Ladd came to realize just how good he was and the two teamed up. Working together, the two devised several new heart operations over the years and experimented with valve replacements and a heart lung machine. When Dr. Ladd retired, Dr. Gross was selected to replace him. In the early 1940’s a young female doctor from Baltimore visited Dr. Gross. Since he was one of the leading Cardiac Surgeons of the time, she discussed with him a theory that she had: Although it was impossible (at the time) to do surgery on the heart, she felt that Tetarology of Fallot (ToF) could be relieved by redirecting some of the major blood vessels. Gross was intrigued by the idea. When this doctor offered him the chance to actually help develop such an operation, Gross hesitated. She seem to be smart enough, and she did work at Johns Hopkins. They were as prestigious as Boston, and wouldn’t just hire anyone. But there were so few female doctors around no one would take her seriously…. and he turned her down. So Helen Taussig, M.D., got back on the train and returned to Baltimore. A few years later Alfred Blalock was named Chief of Surgery at Johns Hopkins. Had Gross accepted Taussig’s offer, the first Congenital Heart Surgery could have been named the Gross-Taussig Shunt. If it had worked. 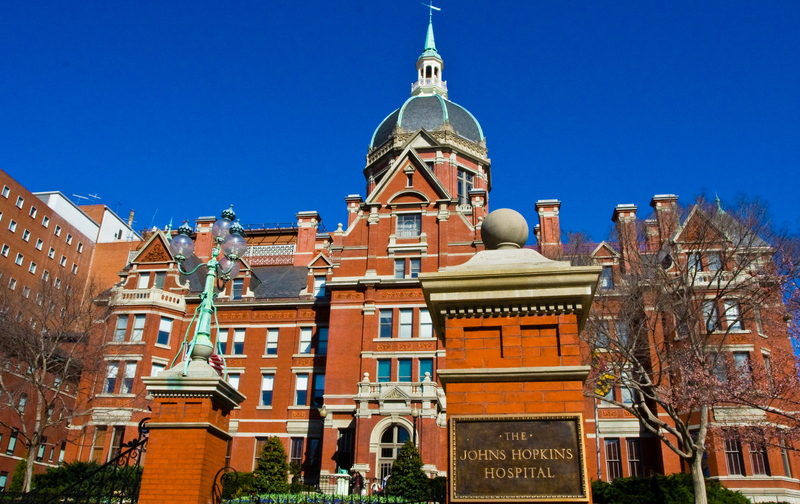 Without Vivian Thomas – who came to Hopkins with Dr. Balock – the operation could have failed and wrecked both of their careers. With the Olympics drawing to a close, the Congenital Heart Defect (CHD) community has been abuzz about the exploits of a talented young man you might have heard of. Unless you have been completely out of touch for the past two weeks, you’ve probably heard about Shaun White. We love the guy; after all, he’s one of us. Shaun was born with a heart defect known as Tetraology of Fallot (ToF) and he’s out there living his life and not letting anything slow him down. A lot of CHDers have (almost) normal lives, too, but we aren’t Double Gold Medal winning Olympic Champions. And if he has any say in the matter, he’s aiming for the next Winter Olympics, too. There is a small problem here, though: Right now, Shaun is in the perfect position to be a great spokesman for those of us living with a Heart Defect. The public loves him. Heart parents, Cardiac Kids, and even tired ol’ Funky Hearts look up to him. But he just doesn’t seem to be interested! “I had heart problems,” he said on The Oprah Winfrey Show – the closest she has come to discussing CHDs in 25 years. HAD? I thought. What happened? Where did those “heart problems” go? Shaun White may be one of the many CHDers who has been lost to good Congenital Heart Defect care. I am hopeful that as time passes and this young man grows a little older, two things will happen: One, that he realize that he isn’t invincible after all, and will find a good Cardiologist who can help him keep that wonderful level of health that he has. Way too often, CHDers “crash” as they grow older – not just the normal effects of age, but age coupled with an old, tired, damaged heart bring us down more than usual. I certainly hope that he can avoid that. And second, perhaps Shaun White, with a little age and maturity, will become not only the Hero in the Halfpipe but a true Heart Warrior, fighting for all the CHDers who cheer from the sidelines. UPDATE: Zeb’s surgery got pushed back – the new date is March 2, 2010. Here’s a bittersweet report that I read earlier today: The newest generation of Cardiac CT scanners reduce radiation exposure by up to 91%. My friend Jim could have used one of those new scanners. Jim was 54 years old; he was from an older generation of survivors. Back in those days when CHD kids were few and far between and hardly anything was known about heart defects, doctors would X-ray and scan a CHD heart from every possible angle. But no one realized the amount of radiation those children were absorbing. So fast forward to today, and our first and second generation of Heart Warriors are passing on. A fair percentage of them are dying not of their heart problems, but rather of various cancers. There’s no real medical evidence (yet) to back this theory up, just stories from friends and relatives and survivors about all the testing they went through, coupled with the knowledge that an unusual number of us seem to pass on because of cancer. Greater love hath no man than this, that a man lay down his life for his friends, reads the scriptures. Jim was a true Heart Warrior, in every sense of the word – he stood up for all of us when there was hardly anyone around to stand up. Even when he was a little kid. The Blalock-Taussig Shunt (Shunt means “detour”) was the brainchild of one of the most unusual people in medicine: Dr. Helen Taussig. Despite being Dyslexic and slowly losing her hearing after becoming a doctor, Taussig had overcome both disabilities to become the head of the Cardiac unit at the Harriet Lane Home for Invalid Children, located at Johns Hopkins Hospital in Baltimore, Maryland. While at Harriet Lane she began to study Congenital Heart Defects, especially Tetralogy of Fallot (ToF). ToF children suffered from a combination of four heart defects which led to the mixing of oxygenated blood with unoxygenated blood inside their damaged hearts. This caused them to have Cyanosis (have a bluish tinge to their skin due to poor blood oxygenation), have poor stamina, difficulty feeding and usually die before they reached ten years old. Despite the fact that these children were breathing hard and deep, they were suffocating – and there was nothing that Dr. Taussig could do about it. Taussig’s frustration would continue until 1943, when Hopkins hired Dr. Alfred Blalock as the new Chief of Surgery. It wasn’t long after his arrival that Taussig and Blalock had a conversation that would change the world. Hopkins legend states that Dr. Taussig literally broke into a conversation between Dr. Blalock and her boss, Dr. Edwards Park, and convinced him to attempt a surgical repair of the defect. Blalock reminded her that it was impossible to operate on the heart (at that time it was impossible) but Taussig contended that what she had in mind was not an operation on the heart itself, but moving the blood vessels around to send more blood to the lungs. She had the idea, but since she was not a surgeon she could not act on it. Little did she know that he already had a partial answer. While studying the effects of shock on the human body, Blalock and his assistant Vivien Thomas had sewn a smaller artery onto the Pulmonary Artery in an attempt to increase blood pressure. Blood pressure had not been affected, but blood flow increased. The challenge now was to recreate the effects of ToF in a dog, perform the arterial connection, and evaluate the results. Swamped with his teaching duties and surgical schedule, Blalock turned the assignment almost completely over to Thomas. An African American with a high school education, Thomas had gotten a job in Blalock’s lab after dropping out of college and had become Blalock’s most able assistant. Re-creating either the heart defect or the planned repair often proved fatal for the dog, but finally Thomas found the perfect combination and a mutt named Anna survived. The next step was to teach Blalock the procedure. The surgeon had observed the operation several times but had never done it himself; Thomas had done the procedure several hundred times – all on dogs. On November 29, 1944, the trio tried the new surgery. They may have operated sooner than they wanted to, but young Eileen Saxon’s condition was deteriorating. Although she was 15 months of age, Eileen weighed only nine pounds and was badly cyanotic. As they were preparing for surgery, Blalock turned to his scrub nurse and quietly asked her to summon Mr. Thomas. Although Thomas had taught him the procedure, he wanted his assistant close by in case there was a problem. Thomas entered the surgical suite and stood behind Blalock, guiding him through the operation and giving advice. Making a five-inch incision on Eileen’s left side, Blalock clamped and cut her Left Subclavian Artery. 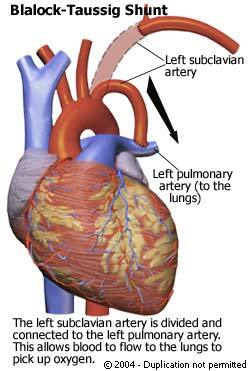 The Left Subclavian branches off of the Aorta, travels along the shoulder blade (the Clavicle) and down the left arm. For a visual reference, the Left Subclavian Artery is located almost directly behind a police officer’s badge. Blalock then placed clamps on the left branch of the Pulmonary Artery and made a small hole in the artery. Gently pulling the Subclavian downward, Blalock sewed the vessel onto the Pulmonary Artery, took a deep breath, and disconnected the clamps. Originally known as a “subclavian to pulmonary anastomosis,”the operation was soon renamed the Blalock-Taussig Shunt, after the surgeon who performed it and the doctor who conceived it. Thomas received almost no credit for his part of the procedure during his lifetime. Survivors of the Blalock-Taussig Shunt often have difficulty getting a pulse or a blood pressure reading in the arm on the shunt side (because of the disconnected Subclavian Artery) and should avoid having injections into that arm. In the late 1970’s the Modified Blalock-Taussig Shunt (MBTS) became popular. The MBTS leaves the Subclavian intact and makes the Subclavian-Pulmonary connection by inserting an artificial tube and avoids the arm problems created by the original Blalock-Taussig. Eileen Saxon did well for a few months but again became Cyanotic as her shunt failed. She underwent another Blalock-Taussig Shunt (on her right side this time) but passed away just before her third birthday. Blalock’s surgical team performed almost 200 Shunts in the space of a single calendar year and the operation opened the door for Congenital Cardiac Surgery. He continued to operate until just before his retirement in 1964, and died six months later. Dr. Helen Taussig became known as “the Mother of Pediatric Cardiology” and had a part in averting the Thalidomide crisis in the early 1960’s. She retired in 1963 but often returned to Hopkins, staying current on the latest Cardiac research and contributing much of it herself. She was killed in an automobile accident in May of 1986. Vivien Thomas continued to stand at Blalock’s shoulder and eventually became Director of the Johns Hopkins Hospital Surgical Research Laboratories. He trained many of the surgeons who would become famous for their heart surgery accomplishments and invented many of the procedures that they would use. He received an honorary doctorate in 1976 and retired in 1979. Thomas wrote his autobiography, Partners of the Heart: Vivien Thomas and his work with Alfred Blalock and died in 1985, just before the book was published. Anna the Dog served as the mascot of the Johns Hopkins Surgical Labs until her death in 1957. She didn’t even have a name for it. When Dr. Helen Taussig wrote Congenital Malformations of the Heart in 1947, she described one malformation as “Atresia or marked hypoplasia of the aortic orifice prevents the expulsion of blood from the left ventricle in the normal manner.” Taussig described several variations of the defect – actually different defects, later grouped together under the same deadly name – but could offer no treatment suggestions. Her Tetralogy of Fallot (ToF) patients could at least squat and get some temporary relief; children cursed with this malady died in less than one week. The left side of the heart wasn’t damaged as much as it just wasn’t there. It wasn’t until 1958 that Dr. Jacqueline Noonan and Dr. Alexander Nadas named the group of defects Hypoplastic Left Heart Syndrome (HLHS). Hypoplastic comes from the root word hypoplasia, which means “small”. But having a name for it didn’t make it any less deadly as HLHS continued to claim 100% of its victims. This sad story continued until 1985, when the first successful infant heart transplant took place. At about the same time the Norwood Procedure was developed. Originally designed as one operation (which consistently failed) the procedure was soon split into two heart operations – and eventually three – which seemed to work. HLHS children now had a chance. Obviously long term survival rates aren’t known yet, but approximately 70% survive the three surgery protocol. And thats when the dirty little secret of HLHS showed itself: While survival rates for the three operation procedure may be in the 70% range, getting from Stage I to Stage II is the hardest step. The goal of the Stage I operation is to make the Right Ventricle do the job of the defective Left Ventricle – getting the blood to the body. With all of the blood flowing through the right side of the heart, that side is subject to higher flow pressures than it usually receives. A lot higher. In a defect in which the entire left side of the heart is damaged, a successful outcome usually depends on the Tricuspid Valve – located on the right side of the heart. The inital results were confusing. The Norwood worked – then it didn’t. There didn’t seem to be any rhyme or reason to it, no way to predict outcomes. The surgery itself worked, but too often the results seemed to be as random as a roll of the dice. The answer was the Sano Shunt, invented by Japanese surgeon Shunji Sano – a direct connection from the Right Ventricle to the Pulmonary Artery through a Gortex conduit. (this sounds redundant, but the Pulmonary Artery is normally disconnected from the ventricle in the Stage I operation). Studies showed that survival chances with the Modified Norwood was 11 times greater than with the Classic Norwood. A study released Monday (September 28, 2009) revealed that for seven years, doctors at several hospitals in Boston and Harvard Medical School have been detecting Aortic Stenosis in fetuses. Fetal Aortic Stenosis is a snowball; it usually becomes HLHS as the fetus develops. 70 future HLHS patients underwent surgery while still in the womb – a needle was inserted into the mother’s abdomen, passed into the fetus, and into the heart of the unborn child. A small balloon was used to enlarge the abnormally small Aortic Valve. 51 of the procedures were considered successful… and 30% (17 children of the 51) were born with two functional ventricles. That’s 17 children who won’t have HLHS. Mark September 28 on your calendar… that was the day that the CHD world changed forever. There is new research into the causes of Tetralogy of Fallot (ToF), focusing on the genetic makeup of ToF hearts. ToF accounts for about 10% of all heart defects, and was the defect that the Blalock-Taussig Shunt was designed to relieve. The B-T Shunt was a palliative measure, meaning that instead of curing the defect, it was meant to relieve it. Even today there is no cure for Tetralogy of Fallot, although it can be surgically repaired. ToF has always been a puzzling defect because the parents of a Tet child usually have no cardiac issues. Recent research only deepened the mystery as it seems that there is no genetic predisposition, either. ToF seems to “pop up” when it wants to. Scientists at the Howard Hughes Medical Institute have recently found some clues into the genetic makeup of the defect. After scouring the DNA of 114 Fallot patients, they have found 11 segments that might lead to the occurrence of Tetralogy of Fallot. They are so small that if you put all these DNA segments together, you can’t see them. Technically these segments are known as copy number variations. The segments control how much protein is produced by a cell, and the variations can cause too much of one protein, not enough of another – and alter your health forever. So now the work shifts to identifying and controlling individual genes. One has already been found: change that gene, and the risk of having ToF multiplies by nine. Perhaps this research will one day lead to a pill or injection for expectant mothers that will stabilize the child’s DNA and prevent the occurance of Tetralogy of Fallot! There are some very important links for you to read tonight, important enough that I held them back yesterday so I could feature them as a group. If you’ve had a surgical repair, these links could come in handy for you. The good news is that they are readable online, printable, and you can download them as a PDF file. (The PDF file may not be complete, that’s explained on the download page. But you can print the entire article.) The bad news is that they appear in medical journals and are written for cardiologists and cardiac surgeons, so they are 100% “Doctor Talk.” Bring an interpreter. But they are important and useful, especially the second and fourth link. A classic case of Tetralogy of Fallot (ToF). Repairing a Tetralogy of Fallot (ToF) Heart: Current surgical thoughts and procedures. The Fontan Pathway: What’s down the road?